This is the big one. The main Christmas wine release at Vintages on Nov. 23 is perhaps the greatest gathering of iconic Niagara wines ever assembled at our government monopoly in one fell swoop. To wit: Both of Stratus’s top wines from a great vintage, 13th Street’s grandest bubbly, Creekside’s iconic Broken Press Syrah from the big-red-loving 2010 vintage, the first Pinot Noir release from the Thomas Bachelder project, one of only three produced from the historic Five Rows at Lowrey Vineyard, Flat Rock’s most popular Pinot, the Gravity, and a rare Port-style wine from Union that is sure to provide a little extra heat for the holiday gathering. If ever there was a time to save and splurge on some of Niagara’s top juice, this is it. One or two of these would look mighty fine under the Christmas tree. I have tasted most of these wines recently but a couple of them were tasted this past summer when they were first released at the winery and have previously been reviewed. Here’s what I can recommend. 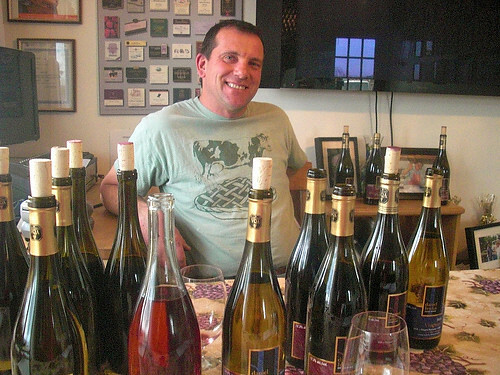 Stratus winemaker J.L. Groux looks out onto his vineyards on a late October day while most winemakers in Niagara are out in full force picking and pressing what they can of what’s left on the vines. “I have no worries,” he says. There is no panic in his voice, no sense of urgency as the temperatures drop. He’s in no rush to pick his red varieties. I learn later that Stratus began picking reds in early November starting with Petit Verdot, Tempranillo and Syrah. The rest of the Bordeaux grapes, well, that’s anyone’s guess when Groux will get to those. It’s a fairly good bet that he’ll be the last to pick in Niagara. Again. Groux likes to let his grapes hang in the vineyard for as long as possible. He believes his red varieties continue to evolve even as temperatures nose dive. It is a big part of the soul of his wines, what makes them distinctly Stratus. 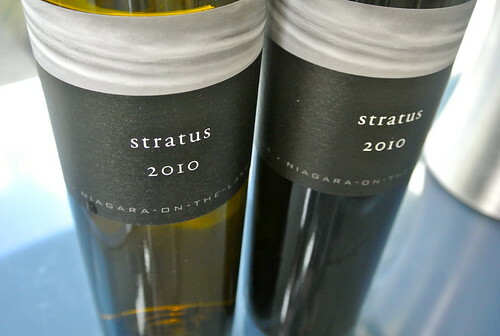 We are tasting both the 2010 Red and White Stratus wines on this day, the top cuvees from this Niagara-on-the-Lake estate. They are some of his best work. The red is a blend of all five Bordeaux varieties, picked at an average of 25 Brix. The grapes are culled to 1.6 tonnes per acre on average with the Cabernet Sauvignon cropped to under a tonne per acre. The wine is aged in oak, 15% new, for two years and sees a further year in bottle before being released. The proprietary white is a more “classic” blend with no Gewurztraminer used in the final wine for the first time. 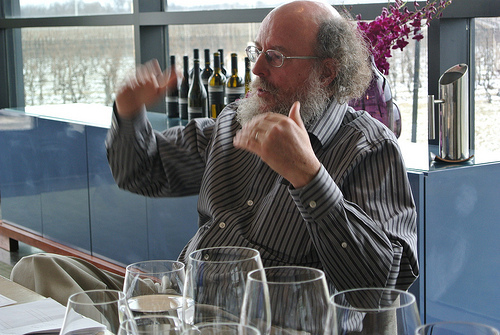 If you are a fan of Stratus’s top wines, you might want to stock up on the 2010 vintage — there will be no 2011s as Groux didn’t feel the vintage delivered the quality he looks for in his top wines. 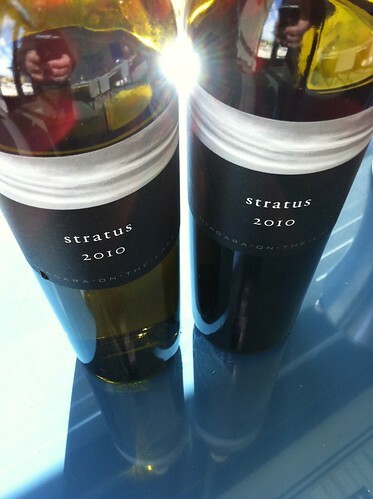 Stratus White 2010 ($44, 92 points) — This is the first time Stratus decided not to use Gewurztraminer in its top white blend consisting mainly of Sauvignon Blanc, Semillon and Viognier. A good call, in my opinion, as the aromatics are already rocking with grapefruit, pear, lanolin, cloves, vanilla, apple and exotic tropical fruits. It has layers of complexity on the palate with a fusion of grapefruit-citrus, pear and oak-inspired spices that promise to fully integrate with time. This is an intellectual white that will continue to evolve in the bottle for five or more years. Such a unique white blend that has few peers in Ontario. Union Forte 2007 ($17, 89 points) — While Port is a widely recognized style of fortified wine it can only be called Port if it comes from Porto in Portugal. That doesn’t stop winemakers the world over from making that style of wine and dreaming up clever names. The folks behind Niagara’s Union Wines, who are well represented at Vintages/LCBO stores, have come up with a Port-style wine called Forte that is a Cabernet Franc/Merlot blend from Niagara with Ontario Brandy spirit added and is finished with 18% alcohol. It has a heady nose of sweet black cherry, cassis, raspberry, bramble, red licorice and an array of spices. It’s sweet and spicy in the mouth and loaded with red fruits, anise and kirsch and all delivered on a bed of smooth tannins. A very enjoyable after-dinner wine. 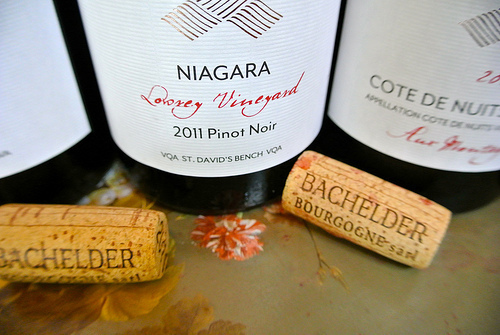 Bachelder Lowrey Vineyard Pinot Noir 2011 ($45, 92 points) — Thomas Bachelder sourced the fruit for his first Niagara Pinot from the Lowrey vineyard’s original five rows in St. Davids. This is a pretty Pinot with violets, black cherry, cassis and earthy-spicy notes on the nose. It’s ripe yet silky on the palate with gorgeous cherry-raspberry fruit that’s persistent through a lengthy finish. Such finesse and verve and balanced already. 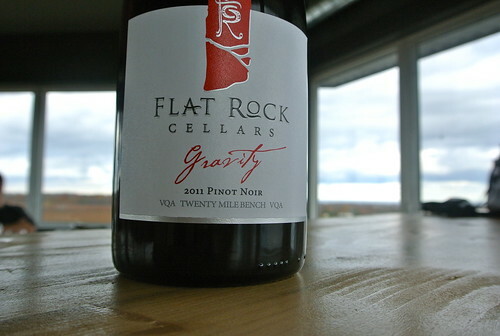 Flat Rock Gravity Pinot Noir 2011 ($30, 91 points) — Flat Rock Cellars’ Gravity is designed to showcase the “best of the best” in the estate’s Twenty Mile Bench vineyard and cellar. That means careful selection of the best parcels of Pinot Noir vines, vinified separately and then the best is chosen from individual barrels. The nose shows generous cran-cherry fruit with a subtle note of earthy goodness and oak spice. It’s pure and delicious on the palate with bright red fruits, ripe tannins, vibrant acidity and good length through the finish. 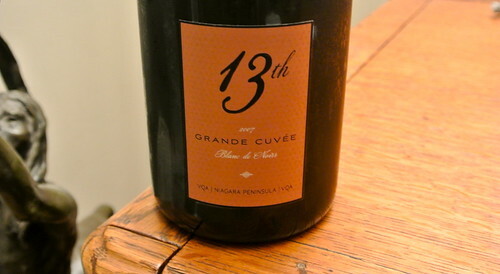 13th Street has worked hard to put itself at the top of the sparkling wine hierarchy in Niagara. The Grande Cuvée Blanc de Noir represents the most rare of the winery’s fine bubbly program and is only made two or three times a decade in exceptional sparkling wine vintages. 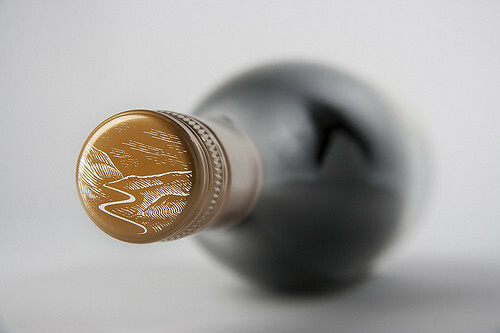 It is made with 100% Pinot Noir sourced from two of the estate’s best vineyards in Niagara. In the spring of 2007, the final blend was made and the wine was bottled along with the “liqueur de triage,” a blend of base wine, yeast, yeast nutrients and sugar. The “prise de mousse” or sparkle was then created and trapped in the bottle. After the secondary fermentation, the spent yeast cells remained in contact with the wine for an aging period of more than 48 months. During this time, the autolysis or self-digestion of the yeast cells occurred and a plethora of aromas and flavours were created. The bubbles in the wine were also forced to become smaller and more stable which resulted in a super fine and mouth-filling, persistent mousse. The initial disgorging of this wine took place in March 2013 with a dosage of barely 2 grams of sugar, a step back from the dosage with the 2006 vintage. 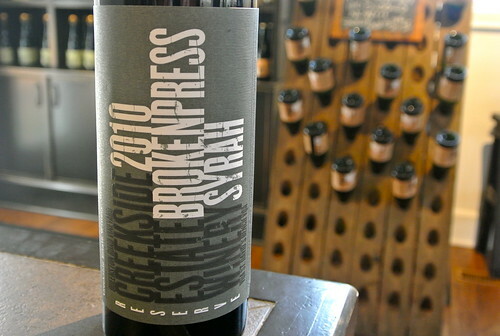 Creekside’s top wine (when they feel it’s good enough to make) has always been the Broken Press Syrah. 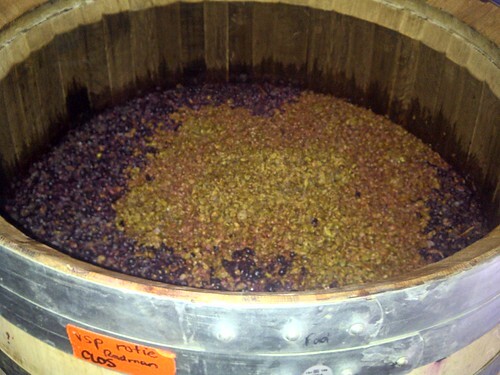 Winemaker Rob Power makes this wine by co-fermenting (see photo below) about 4% Viognier (mostly skins) with the Syrah. The fruit was harvested Oct. 9 from the estate’s Queenston Road Vineyard in St. David’s Bench vineyard. The Syrah was crushed to one tonne bins and the Viognier was lightly pressed before adding their juicy skins to the Syrah. After a two-day cold soak the must was fermented in demi-muid barrels with manual cap management. Malolactic fermentation took place in barrel where the wine aged for 21 months. After tasting and deliberation, seven older French oak barrels were chosen for this blend. It was bottled on Aug. 16, 2012. Daniel Lenko Old Vines Merlot 2010 ($35, 90 points) — Lenko’s Old Vines Beamsville Bench Merlot spends 18 months in a mix of new and older French and American oak barrels. It starts with black cherry, blueberry and kirsch notes with added licorice, field raspberry, bramble, earth and toasted vanilla and spices. It is but a pup on the palate with the tautness of youth, tight tannic structure and ripe red and dark fruits just beginning to open up. There are a lot of moving parts here but the ingredients are all there to come into wonderful harmony with time in the cellar. 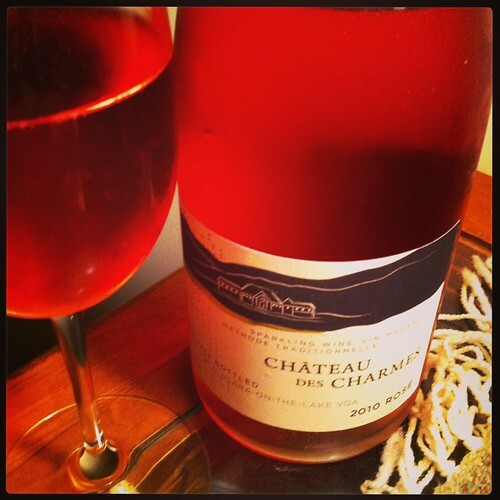 Chateau des Charmes Rose Sparkling Wine Method Traditionnelle Estate Bottled 2010 ($29, 89 points) — The sparkler was released at Vintages in October, but I am just now reviewing it as it is a delightful wine to have on hand during the approaching holidays. This sparkling wine is a 50/50 blend of Chardonnay and Pinot Noir with extended skin contact to extract the bright colour. The grapes were sourced from all four of CdC’s vineyard sites from vines that were planted as early as 1991 through 2003. It spent over two years on the lees. This sparkler is a product of the warmer growing season of 2010. The nose shows ripe raspberry and cherry fruit with just a hint of citrus. On the palate the wine is sweeter than I remember previous vintages with fleshy, ripe fruits and a persistent bead of lively bubbles. Tinhorn Creek Gewurztraminer 2012 ($25, 88 points) — A Gew that’s not overdone or over-spiced with grapefruit, lychee, citrus and subtle notes of musk, rose petals and exotic spices. It’s fairly balanced on the palate with juicy fruits and more acid than you’d expect with this fleshy, exotic varietal.